Just In! We found a New Buddy Crate for our All in One Packge! Due to our old Buddy crate being discontinued we were fearing having to stop offering this size. But with a little research we found a comparable crate kennel that is very similar to the old carrier and suitable for Airline Pet Travel. This crate or kennel size is perfect for most cats and small dogs and is in between the 100 and 200 series size of the Sky Kennel. Our Airline Crates have all the latest state of the art safety features like pre-drilled Cable Tie Holes around the doors, Ventilation on all 4 sides, Solid Metal Nuts and Bolts, Covered Door Posts. Don't waste your time getting all the things you need separately for your crate to travel. Just get a ''all-in-one'' package from here and you're ready to travel. Everything arrived quickly and complete. Thank you again. Kennel arrived quickly and well packed. It was easy to put together. Thanks! This carrier really is "all-in-one". 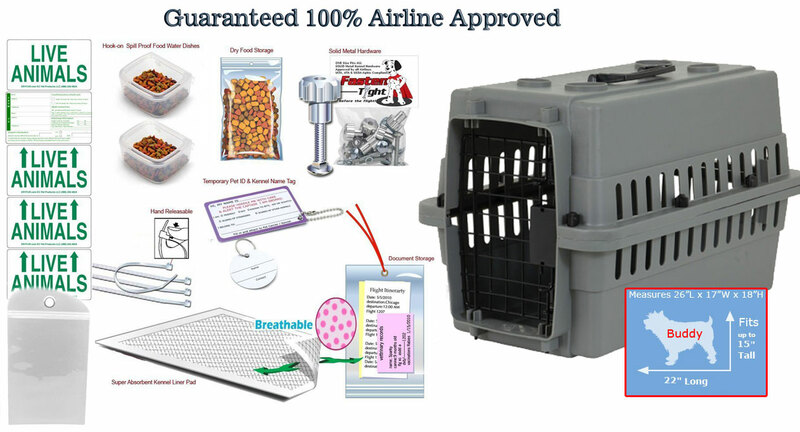 If you get one of these packages, have all of the required paperwork, and follow the instructional video, you should have no problems flying your pet in cargo. This type of carrier with everything included was surprisingly hard to find anywhere else on the online, so I didn't have much reference for comparing prices. Now, I am sure it was worth it. I coordinated our cat's trip from overseas and had the carrier delivered to a friend. They assembled it according to the video and had no problems. Very satisfied. My family and I are moving out of state. We decided to fly our cat instead of drive her. We have so much going on with the move that when I spoke to the airline we chose to use, I was overwhelmed with the rules. The Buddy Kit had everything needed, i.e. metal fasteners. Not only did Kats N Us provide the kit they also provide a video of how to put it all together. Thank you Kats N Us! Getting everything I needed for international travel in one kit was a relief. The crate went together easily and solidly, and protected my cat well on our trip from the US to Korea. Delivery was prompt but not totally in love with the kennel construction(top and bottom didn't fit together very well) but the hardware definitely over-compensates for it and all the accessories seem to be as promised. The USPS rates are outrageous (doubles the cost of the kennel) for an APO address but they do deliver to APO addresses...grateful for all the airline specific materials since the rules are a literal maze of confusion, relieves some of the stress involved. Excellent craftsmenship. I refer to it as the "Cadillac" of all kennels. My dog actually enjoys spending time in it which is crazy and makes me much more comfortable with her needing it for a plane ride to Hawaii. We are military and moving overseas with our 2 dogs. I looked at a lot of pet stores but couldn't find everything in one place or at all. I found your site and your package came with everything included. I also needed 2 crates and you even had a double package. It was very convenient. The only disappointment is that you don't offer a military discount. If you did then it would be perfect!! Thank you for making it so convenient.